Oct. 13, 2016 11:00 a.m.
A truck driver is fine but his semi-truck suffered some damage after the driver hit a tree that had fallen across Highway 4 in Cathedral Grove, early Thursday morning (Oct. 13, 2016). 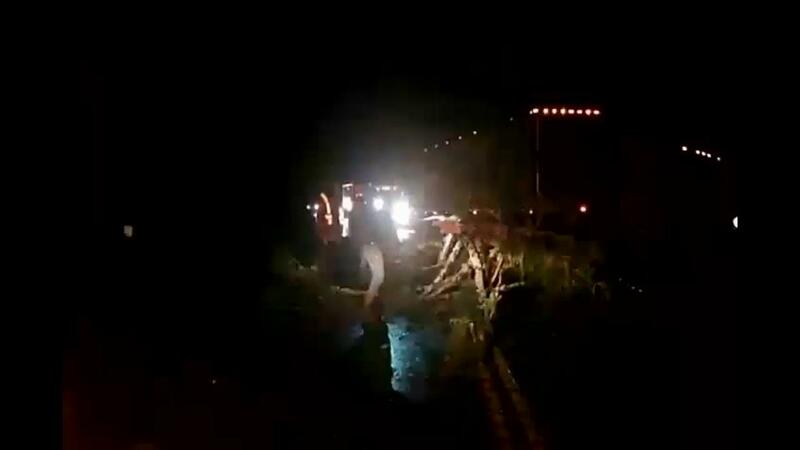 “I was coming back from Qualicum Beach this morning and there was a tree down in the Grove and a semi had crashed,” said witness Becky Lee, who took some video at the scene. Port Alberni RCMP received a call at 7:15 a.m. that the truck and trailer had collided with the tree, Cpl. Amelia Hayden said.The driver had been headed eastbound when he came around a blind corner and wasn’t able to stop before hitting the tree. Emcon Services removed the debris. No one was hurt in the incident, but it serves as a reminder to drivers this weekend to slow down, Hayden said. Environment Canada has issued wind warnings, especially for western Vancouver Island, ahead of a pair of storms that could cause damage: Port Alberni could see winds gusts up to 90 kilometres per hour overnight, and intense rain is also expected. “If we get the severe weather that’s anticipated, with heavy winds and rain, it’s not recommended you travel unless you absolutely have no option,” Hayden said.